The cervical spine is the name given to the seven small spinal bones or vertebrae that reside in the neck. The cervical spine is the name given to the seven small spinal bones or vertebrae that reside in the neck. These vertebrae have the huge jobs of supporting the head, protecting the spinal cord and providing the mobility to the head and neck. These are the thinnest and most delicate bones. They start at the base of the skull. Spinal bones have discs between them which are thick, pad-like cushions that absorb the shock of lifting, twisting and other activities. Cervical spondylosis is a general term for age-related wear and tear affecting the spinal discs in the neck. As the discs dehydrate and shrink, signs of osteoarthritis develop, including bony projections along the edges of bones (bone spurs). The age related spondylotic changes may result in direct compressive and ischemic dysfunction of the spinal cord known as cervical spondylotic myelopathy. Nowadays cervical spondylosis is a common spinal problem which is prevalent all over the world. It is a chronic degenerative condition of the cervical spine that affects the vertebral bodies and intervertebral discs of the neck as well as the contents of the spinal canal. It may also include the degenerative changes in the joints and ligaments. Though degeneration of cervical vertebrae is mostly seen in elderly people but its prevalence is increasing in early or middle age also. Continuous sitting or standing posture, working on computers perpetually and lack of exercise are some of the dreadful components of current lifestyle. The prevailing consequences of such lifestyle appear in numerous problems like metabolic, musculoskeletal etc. Cervical spondylosis or osteoarthritis of the cervical spine produces neck pain which may radiate to the shoulders or arms with headache (posterior occipital region). Narrowing of the spinal canal by osteophytes, ossification of the ligaments or a large central disc prolapse may compress cervical spinal cord. Age, gender and occupation are the main risk factors for cervical spondylosis. Intervertebral discs lose hydration and elasticity with age and these losses lead to cracks and fissures. The surrounding ligaments also lose their elastic properties and develop traction spurs. The disc subsequently collapses as a result of biomechanical incompetence. The bones and protective cartilage in neck are prone to wear and tear that can lead to cervical spondylosis. The gel-like material inside the spinal discs can dry out over time [Dehydrated spinal discs]. This causes bones (spinal vertebrae) to rub together more, which can be painful. Spinal discs can develop cracks, which allows leakage of the internal cushioning material [Herniated discs]. This material can press on the spinal cord and nerves, resulting in symptoms such as arm numbness and pain that radiates down an arm. Any injury to the neck can accelerate the ageing process .The tough cords that connect the spinal bones to each other can become even stiffer over time, which affects neck movement and makes the neck feel tight [Ligament stiffness]. Some occupations or hobbies involve repetitive movements or heavy lifting, such as construction work. This can put extra pressure on the spine, resulting in early wear and tear. The greatest risk factor for cervical spondylosis is ageing. A person can ease the symptoms of cervical spondylosis with a few simple neck exercises such as neck stretch, neck tilting & neck turning. While these exercises can be effective, they will not cure cervical spondylosis. They can help to moderate the impact of the condition and alleviate pain or feelings of stiffness,but should be done only after consulting the Physician. Warm compress- Soothes painful muscles or joints. Ice packs- Reduces inflammation and dulls sensation of pain. Physical exercise- Aerobic activity for 20 to 30 minutes. If injured, pursuing an activity that avoids the involvement of injured muscle group or joint can help maintain physical function. Non-steroidal anti-Inflammatory drugs, muscle relaxants and surgery. • Ayurvedic Herbs like ginger, turmeric, sesame seeds, erand. • Panchkarma procedures like abhyang, swedan, griva basti. Cervical spondylosis is a chronic degenerative condition of the cervical spine that affects the vertebral bodies and intervertebral discs of the neck as well as the contents of the spinal canal. Bone spurs are the overgrowths of bone and are the result of the body trying to grow extra bone to make the spine stronger. However, the extra bone can press on delicate areas of the spine, resulting in pain. If the doctor suspects cervical spondylosis, he will go through imaging tests like Xrays, CTScan, MRI scan & Nerve conduction study. • Skipping activities like running and high impact aerobics. • Doing regular exercises to maintain neck strength, flexibility and range of motion. • Taking breaks when driving, watching TV or working on a computer to keep from holding the head in the same position for long periods. • Practising good posture, with the neck aligned over shoulders. • Protecting the neck from injury by using a seat belt when in a car and avoiding activities that strain the neck. 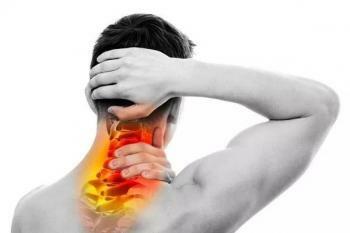 • Work-related activities that put extra strain on the neck from heavy lifting. • Holding the neck in an uncomfortable position for prolonged periods of time or repeating the same neck movements throughout the day (repetitive stress). • Genetic factors (family history of cervical spondylosis). • Being overweight and inactive.